DESCRIPTION: Three similarly marked Wells, Fargo & Co. Pony Express usages: Figure 1 is a cover with a single 1862-64 issue Wells Fargo blue 25 cent local stamp on an U.S. 1861 three cent pink on buff paper postal stamped envelope, canceled with a blue WELLS, FARGO & Co./OCT 6/GOLD HILL N.T. 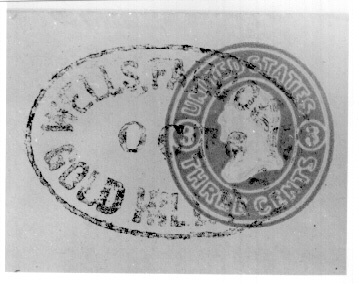 oval date stamp, addressed to Folsom, California; Figure 2 is a cover with a single 1862-64 issue Wells Fargo red 25 cent local stamp on an U.S. 1854 three cent red on buff paper postal stamped envelope with PAID Wells, Fargo & Co. imprint frank, canceled with a blue WELLS, FARGO & Co./SEP 14/GOLD HILL N.T. 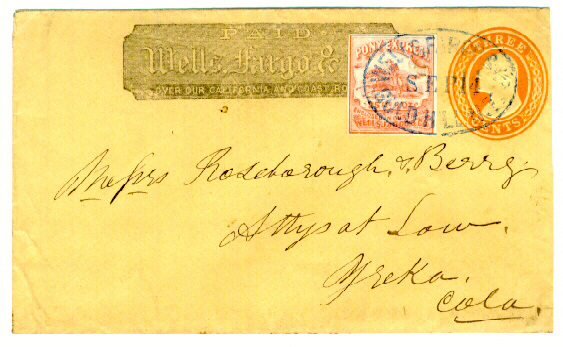 oval date stamp, addressed to Yreka, California; and Figure 3 is a cover with a single 1862-64 issue Wells Fargo brown 10 cent local stamp on an U.S. 1861 three cent pink on buff paper postal stamped envelope, canceled with a blue WELLS, FARGO & Co./SEP 7/VIRGINIA CITY N.T. 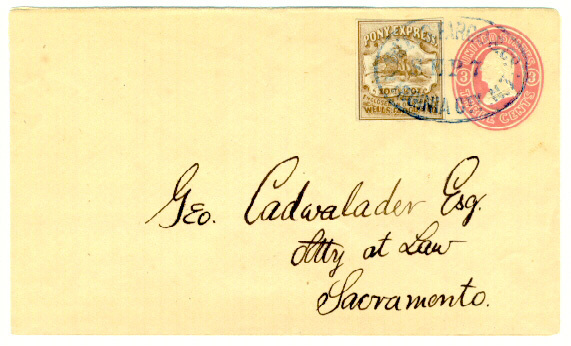 oval date stamp, addressed to Sacramento, California. APPARENT USAGES: Fully prepaid, 3¢ per half ounce, U.S. single domestic rate, plus additional Wells, Fargo & Co. Pony Express fees (initially 10¢ but later 25¢ per half ounce) charged for carriage on the “Virginia City Pony,” a service which Wells Fargo operated beginning in August 1862 between San Francisco, Sacramento and other intermediate points, and Virginia City in the Nevada Territory. ANALYSIS: All of the covers shown at Figures 1, 2, & 3 were faked in approximately the same manner. In each case the faker took a genuine unused U.S. 3 cent postal stamped envelope, manually wrote the name and address to a legitimately known addressee, affixed a genuine unused 1862-64 issue Wells Fargo local pony stamp, and applied a counterfeit strike of a known Wells Fargo oval date stamp. The general dimensions of the strikes of the Gold Hill, N.T. oval date stamps in Figures 1 & 2 are quite close to the authentic in almost all areas. However, the overall quality of the strike appears very mottled (see Figure 4), with the letters fuller and not nearly as delicate in nature as with genuine examples. There are minor style differences in many letters, as well as differences of width and sharpness in certain of the letters. For example, the “G,” “L” and “N” in Gold Hill, N.T. are from 0.5 to almost 1.0 mm wider than should be the case, even allowing for variations in strike pressure. Ironically, the letters of the date line are slightly sharper and smaller in Figure 2 than in the genuine. Similar mottled characteristics and dimensional letter variations are noted in the Virginia City, N.T. oval date stamp in Figure 3. For example, the “C” in “& Co.” is not as narrow an oval shape and the position of the “o” is noticeably lower as related to the “C” than in the genuine. Additionally, the color of the blue cancel in this and the previous Gold Hill, N.T. oval date stamps in Figures 1 & 2 is too light a shade when compared to genuine strikes. Addressees and handwriting on the three covers provide the final damning evidence of fakery. 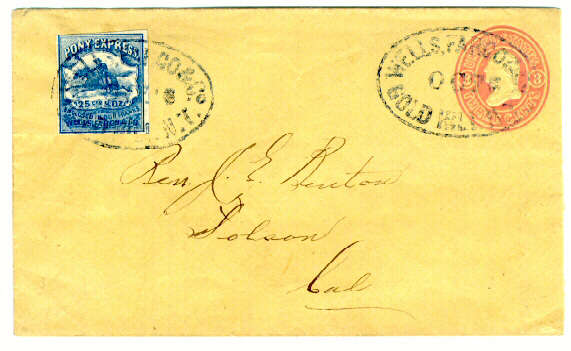 The addressees on all three covers are known to postal historians for the period of indicated use. For example, Rev J(ohn) E. Benton shown on Figure 1 is known on no less than seven genuine Virginia City Pony covers of the period by four different senders. However, that name has also been found on at least three other faked Virginia City Pony covers. The handwriting on the Figure 1 cover exactly matches one of the latter. The slants and flows of the addresses in figures 2 and 3 are similarly identical to those found on other recognized spurious covers. All three covers discussed here have the same aspects and traits as many other known fakes which have been attributed to a well known deceased New York dealer and postal history faker. One final observation; very few genuine covers carried on the Virginia City Pony were not of the type with PAID Wells, Fargo & Co. imprint frank on an embossed postal stamped envelope. While the Figure 2 cover has such a frank, it is absent in Figures 1 & 3. CONCLUSION: Genuine period U.S. postal stamped envelopes and genuine unused Wells Fargo local stamps were combined with spurious Wells Fargo oval date stamps to produce these dangerous philatelic fakes.